For centuries the precious documents of the parish were stored in a locked chest in the church for their safe keeping. The St-Keverne Local History Society is hoping to place on this web site as many of the numerous documents, photographs, illustrations and recordings relating to the history of the parish of St-Keverne on the Lizard Peninsula Cornwall, as it possibly can. We hope to cater for everyone interested in the parish history and the site will be useful to those tracing their family history as well as those with a more general interest. The majority of the statutory documents such as baptism, marriage and burial listings have been in the care of the Cornwall County Record Office since the early 1960's as have many other records of interest to family historians such as census returns, protestation returns and hearth tax listings. But we feel that all of these are of such fundamental interest that we must include them. 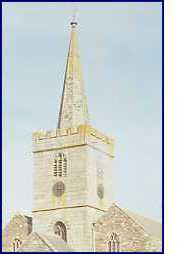 We hold the archive produced by Canon Diggens who was vicar in St Keverne at the end of the 19th century. He researched into every aspect of our history available to him at the time in both national and local archives. One example, from the State records, of information sent in 1640 to King Charles 1st from Algiers stating that "here are about 5,000 of your subjects in miserable captivity...."
Over the centuries we have a number of records of fishermen being snatched from their boats of the coast of the parish by "Algerines" and "Flemings" and many of the 5,000 unfortunates mentioned above would have been Cornish and from this parish. He also consulted "the oldest inhabitants" and wrote down their memories on subjects as varied as how the post office were persuaded to deliver mail to the parish to where buildings have been demolished. The archive can be viewed by clicking on the Canon Diggens links. The Shipwreck of The SS Mohegan on the Manacles in 1898 and the terrible loss of life of 106 passengers and crew, is told in tape recordings made in October 1966, and is now available as a podcast, along with talks by some of our guest speakers. You can read about the making of the Mohegan Tapes by clicking here. The tapes record interviews with three St. Keverne people who had either witnessed the tragedy or who had heard first hand accounts of it within their families. You may download the St Keverne Parish records, family genealogies, some of the Mohegan tapes, and other recordings from the downloads page, to view or listen to at your leisure. If you have origins in the parish we would like to hear from you and if you have written the history of your family we would like to include it in the archive. The parish has a history that can be traced back for thousands of years and it has been studied by numerous historians, both amateur and professional, for several centuries. Ideas change and opinions vary so if you are researching a particular subject we suggest that you consult as many sources as you can and make your own mind. The On-line Parish Clerk (OPC) scheme operates a look-up service to help family historians. There are two OPCs for St Keverne: Diane Donohue, and Terry Moyle enquiries are welcomed by either. This website is paid for by subscriptions and donations from members of the St. Keverne Local History Society. All transcriptions, other content and works on this site, have been carried out and provided by unpaid volunteers.